Fully annotated solutions to the problems in the text of Physics of the Body, 2nd Edition. 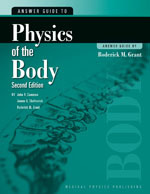 Physics of the Body, Second Edition is intended primarily for students who plan to make a career in some field of medicine. The authors rely on basic physics principles to promote an understanding of the function of the various organ systems of the body. Although it was written primarily as a text for students who have some knowledge of elementary physics, it is understandable to any person who is curious about the workings of the body. The mathematics is at the algebra level. Illustrated with more than 220 figures and tables. The Instructor's Guide includes answers to all of the problems in the book.